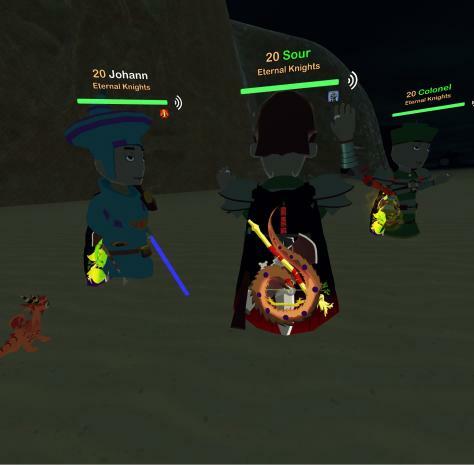 Eternal Knights now has a formal application process up and running for those with interest in joining us to take on everything Orbus has to offer! Please be aware that depending on the number of interested parties (and our desire to get to know each applicant), it may take some time to get the process started, but we will keep everyone informed every step of the way. Before anyone applies, a couple quick notes! We do not discriminate based on race, gender, sexual orientation, ethnicity, religion, nationality, HMD choice, locomotion preference, or when you joined Orbus. We value positivity, skill, teamwork and lack of egotism. We strive for a friendly, supportive environment and do not shy away from challenges or obstacles. Eternal Knights is founded on the two core principles of Honor and Dignity which means we do not condone toxic behavior or cheating by our members. If you are looking for a Fellowship which tolerates these types of things, then this is not the place for you. Our current primary focus is on end game content and the supporting gameplay to defeat it, but we actively participate in everything Orbus has to offer, from community engagement to PvP to theorycrafting and more. Due to our focus on end-game content, we are currently only accepting applications for level 20 players. We apologize for the inconvenience. Members of the Eternal Knights spend a lot of their time helping new players learn the game and answering questions. While we strive to be at the forefront of end-game content completion, we don’t wish to do it at the expense of being positive contributors to the community. As such, we are much more interested in applicants with positive attitudes and a willingness to learn than those with high skill but elitist or toxic attitudes. If all of this sounds like something that might be a good fit, please visit our website and click Apply to Community. Please let me know if anyone has any questions and we look forward to meeting you! cool to hear! didnt know you guys had a website. Please be aware that due to significant interest (and us wanting to spend adequate time getting to know each person), additional applications at this time may have an increased waiting period before the formal application period starts. You will be notified if this is the case. Second world boss is down! Look at our awesome cape! Lol amen Justin, he got like 7 elongata capes before I got one. we have 7 so far. Here is a mid attempt. EK members now all have the second world boss capes! Congrats everyone! Wait, what exactly is the context here? Are you asking why members of the Blacklisted fellowship aren’t welcome to join EK raids or why they aren’t allowed to apply to join EK? For the record, anyone is welcome to apply to Eternal Knights if they meet our guidelines above and share our stated ideals. All applicants are given due consideration. Our recruitment thread isn’t really the ideal place for this discussion, but I also like full transparency, so I guess we’ll see how this goes. I may be wrong, but I think Zack has looked at your website and maybe misunderstood the Blacklist. Please correct if I’m wrong, but the Blacklist on the EK site is a term and not a reference to the fellowship? Ohhhh, yeah, that might be it. I could see how that could sound like the entire fellowship, though I believe the name of it actually comes from our posting of the one player on the list so there is some interesting recursion happening here either way. Yes that is correct, i thought the page meant ALL blacklist members, my appologies if it didnt come off that way. That makes a lot more sense now that you explained. Sorry for posting it on the recruitment page, im new to the forums so im not really sure how to direct message someone. Thanks again! No problem, I’ve updated the language to be more clear. Thanks for the feedback!